$10 Coles Express Voucher for Online Bookings! 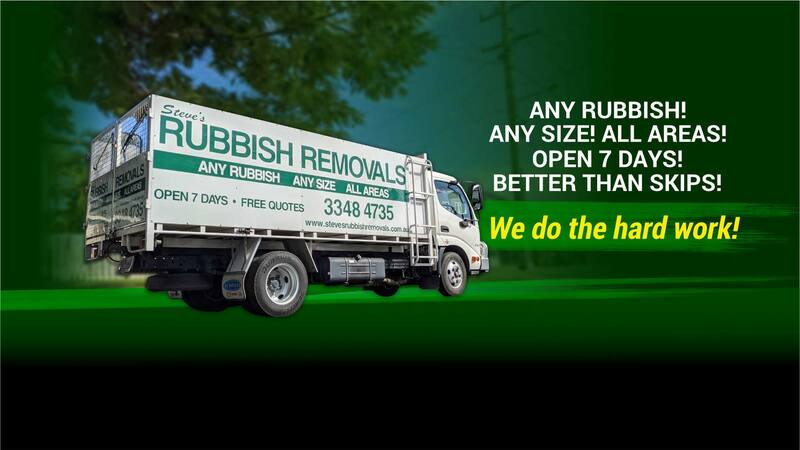 Steve’s Rubbish Removals is your number one stop for rubbish removal in Brisbane. These days almost everyone is short on time – time to spend with family, time to run a household and even just time to wind down and relax. That’s why Steve’s Rubbish Removals is here to do the dirty work for you! As Brisbane’s leading rubbish removal service, we are dedicated to disposing of waste safely and efficiently. Here at Steve’s Rubbish Removals, we take a hands on and honest approach to rubbish removal in Brisbane and always dispose of your your rubbish to the correct places, whether it be household, commercial, green waste or real estate waste. Household garbage can accumulate unassumingly fast, especially when more important responsibilities push your spring clean down on the priorities list. Our garbage removal services cover furniture, carpets, appliances, clothing, toys, white goods and general rubbish, you name it!, allowing you to reclaim the space in your home without lifting a finger. Have you recently moved offices and looking for rubbish removal in Brisbane? Steve’s Rubbish Removals also disposes of commercial waste from offices, shops and business, helping business owners to save on removal costs by taking care of the problem before it gets out of hand. We remove office furniture, flooring, shop fittings, plastics, e-waste, fences and green waste. You name it! Green waste produced by tropical storms and working in the garden can be difficult to remove without a helping hand. Our Brisbane rubbish removal services takes care of branches and palm fronds, fences, greenhouses, decks, vegetation, clotheslines, hills hoists, water tanks, outdoor furniture and much more. At Steve’s Rubbish Removals we are also passionate about protecting the environment and we can recycle your rubbish from Brisbane and surrounding areas properly. Steve’s Rubbish Removals helps tenants, real-estate owners and builders by removing abandoned rubbish, end of lease clean ups, deceased estates, down sizers, the list is endless! We’ll load it into our truck and clean up the site before we leave! We offer our services of rubbish removal to Brisbane City, Logan, Bayside, Ipswich and the Redlands – removing your household, commercial and green waste. Our family-owned and operated business is open 7 days a week including public holidays. Our strong reputation has been built on our reliable and customer orientated service since 2001 – we are known as one of the premier rubbish removers in Brisbane. This is a fact that many Brisbane households and business owners attest to. Any Rubbish, Any Size, Any Suburb!